14 June 2011- Energy and Climate Change Minister Greg Barker has welcomed the publication of the Coalition Government’s Anaerobic Digestion strategy and action plan. AD offers a local, environmentally sound option for waste management that helps us divert waste from landfill, reduce greenhouse gas emissions and produce renewable energy that could be used to power our homes and vehicles. Farmers and gardeners can also benefit from the fertiliser produced, returning valuable nutrients to the land. Spare capacity in water company anaerobic digesters should be available to co-digest solid waste together with sewage sludge and generate ’renewable’ biogas, says the Chartered Institution of Water and Environmental Management (CIWEM) in its new Policy Position Statement on co-digestion. Too often this is hampered by complex regulations governing the recycling to land of the solid output (a useful soil conditioner) and wrangling over how the financial proceeds should be reinvested into the tightly regulated water industry. CIWEM believes that co-digestion of solid waste with sewage sludge represents the best solution for the environment where headroom water company digester capacity exists, as it makes efficient use of existing infrastructure and expertise. But a conflicting regulatory landscape governing sewage sludge on the one side and biodegradable waste on the other, means it can be difficult or expensive to recycle digestate to the environment beneficially. This is despite Defra and DECC promoting anaerobic digestion (AD) as a method of generating renewable fuel and diverting organic waste from landfill, and Defra stating that it sees the water industry as being central to the expansion of AD. CIWEM is calling for a range of changes, including revision of the Sludge Use in Agriculture Regulations to reflect the benefits of co-digestion and establish a clear legislative framework for all treated organic residuals; a financial regulatory framework which meets the needs of both the water and waste industries and an update to the Quality Protocol for Anaerobic Digestate (PAS 110) to include provision for the use of sewage sludge as a component of the feedstock. These issues will be discussed at CIWEM’s forthcoming conference, The Water, Waste & Energy Interface - Realising the Potential of Anaerobic Digestion: Removing the Barriers on 28th June in London. At least 5.5m tonnes of feedstock could be required to supply the UK biogas industry by 2013, according to a study launched at Cereals 2011. The survey of anaerobic digestion projects by Enagri estimated there could be around 150 on-farm and waste-fuelled biogas plants in the UK in two years' time. It said there were currently around 35 operational on-farm biogas plants, with another 13 under construction or granted planning permission and 20 or so announced or going through the planning process. In addition, the report included 83 waste treatment AD plants. The number of on-farm AD plants identified was higher than figures often quoted in the media, but remained well below the 1,000 farm and waste plants 2020 target suggested by the NFU and Anaerobic Digestion and Biogas Association, Enagri's Richard Crowhurst said. "Anaerobic digestion in the UK is even more fragmented than the biomass power sector, and it's only when you start to look in depth that you see it's in better health than some people believe. That isn't to say there aren't challenges, and more support is needed for on-farm schemes. As with other renewable technologies, the main challenges continue to be planning, financing and the need for consistent government support." Municipal solid waste and food waste were likely to make up at least three-quarters of total feedstocks, while energy crops grown specifically for use in digesters accounted for just 5%. Waste from animal husbandry, including slurry, manure and poultry litter, accounted for around 6%, the report said. Energy crops were most popular in the East Midlands, while animal wastes were more widely used in Dorset and the south-west. There was particularly strong demand for municipal waste in the urban north-west and south-east England. Potential demand in Kent could see the county treat the greatest quantity of waste, with demand forecast to reach 750,000t. It is widely accepted that whilst anaerobic digestion is a proven, effective and highly efficient treatment system, upsets in performance remain common. Where Anaerobic Digestion is used in Upflow Anaerobic Sludge Blanket (UASB) digesters as a treatment process for water treatment before it is discharged into a watercourse or stream, or even into a sewer for further treatment at a sewage works, even small variations in performance can have damaging effects. The advantages of AD are substantial. A correctly run digester will efficiently convert up to 95% of organic material into a low odour stabilised slurry, and produce a renewable resource in the form of biogas that can be flared or utilised on site. This eliminates the need for additional solid handling and large-scale pond systems, and limits reliance on non-renewable fuels. Digester disturbances, however, continue to represent a significant risk limiting the widespread adoption of this technology. In South Africa, under Department of Water Affairs (DWA) water use licence conditions, the discharge of untreated effluent into water bodies, following reactor failure, can attract non-compliance penalties of millions of Rands and, under special limit conditions, force full production shutdown of operations for lengthy reseed periods of the digester. Consequently, new applications are often over-engineered, under-loaded and relatively expensive. Despite decades of research into anaerobic digestion technology, a fundamental understanding of upstream effluent management, system sensitivity and basic process control continue to be highlighted as ongoing concerns, severely limiting the reputation and diversification of this technology. One company which reckons to have got this problem under control is the South African AD design and installation company Talbot & Talbot (Pty) Ltd. They are a solutions-based wastewater engineering company with over 20 years of effluent treatment expertise. They continue to successfully build and operate Upflow Anaerobic Sludge Blanket (UASB) digester treatment systems throughout South Africa and Africa, across a wide range of industrial sectors. 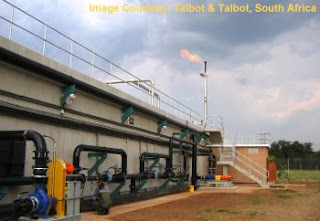 Digesters designed and built by Talbot & Talbot vary in capacity from 1Ml/day to 5Ml/day, treating between 1ton and 25tons of COD/day, under general limit and special limit licence conditions. They believe that a high performance anaerobic digester (AD) treatment system is attributed to a fully integrated approach, which begins with a systematic site water management plan and process optimisation within the clients’ core business. 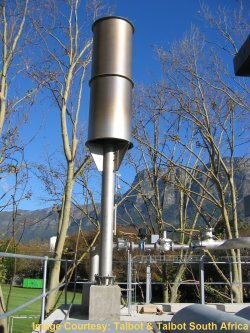 They have found that Upstream focus is essential in preventing discrepancies in effluent data which result in incorrectly designed, overloaded and poorly performing digesters, to segregate and correctly dispose of solid waste streams, and to ensure potentially harmful contaminants are identified and isolated from the effluent system. Plant design and construction is offered on a full turnkey basis in addition to a full aftercare service through Talbot Operations, a business division of Talbot & Talbot (Pty) Ltd. This includes operator training, performance review and compliance monitoring on a support basis, and a dedicated team of competent operations and maintenance personnel on a fully outsourced basis. In addition, effluent sampling schedules are implemented via Talbot Laboratories to rapidly identify changes in effluent quality and monitor final discharge compliance. This guarantees the long-term treatment potential of UASB technology and a full commitment to the industry, which cannot be achieved on a “build only” basis. A well managed, high performance AD system provides clients with the opportunity to recover water and energy resources from their effluent. Secondary treatment systems in the form of activated sludge (AS), sequential batch reactor (SBR) and biofilter technology provide exceptional effluent treatment options, whilst water reclamation can be incorporated via ultra filtration and reverse osmosis technology. More recently, Talbot & Talbot have successfully designed and commissioned biogas recovery systems which capture the bi-product of digestion, methane, as a renewable, CO2 neutral energy source. A 25ton digester with a biogas production of 6500Nm³/day can typically produce 52tons of steam per day, which supplements non-renewable energy usage by up to 15%. The realised value of a biogas recovery project (BRP) can be directly comparable to the cost of the fuel it replaces. As transport fuel prices continue to rise the logistical cost of supplying fuel to remote locations becomes a bigger consideration , and similarly concerns about the availability of reliable electricity supplies throughout Africa will continue to mean that having your own source of supply by AD has a potential beyond mere economics, which Talbot & Talbot is increasingly unlocking for its clients. Adding a CHP (Combined Heat and Power Plant) coupled to an existing AD, to use heat which would, have otherwise have been wasted, typically offers a buy-back period of less than 2 years and forms a reliable, constant energy source to the industry that directly offsets the cost of effluent treatment. However, despite these benefits, Talbot & Talbot state that the real value of BRPs is the renewed interest in AD technology, a deeper understanding of good effluent handling practises and an ongoing commitment to ensuring anaerobic digesters reach their full treatment potential. Vist the Talbot & Talbot website for more information. In recent years there has been a lot of interest in renewable and alternative energy sources. This has seemingly become an even bigger issue in the wake of the Japanese nuclear crisis, where the nuclear plant at Fukushima was damaged by the earthquake and resultant tsunami on March 11th. There is now a real danger that harmful radiation could escape from the site. People have always been uncertain of the safety of utilising nuclear power and such a scare only serves to heighten their concerns. That is why increasingly people are looking for alternatives. One such alternative is the use of biofuels. The term 'biofuel' refers to a broad range of fuels that are created from 'biomass' (see below). Biofuels are often used as an additive rather than as a 'pure' fuel. Bioethanol is an example of this. It is an alcohol created by fermenting the sugar components of plant materials and whilst ethanol can be used as a fuel for cars in its purest form, it is normally added to petrol to improve the emissions from the vehicle and increase octane. Ok, so what is Biomass? This involves the use of heat in order to convert biomass into an alternative chemical form. There are different forms of thermal conversion - two examples of which are torrefaction and pyrolysis. This is quite simply where a range of chemical processes are used in order to convert biomass to alternative forms. This involves harnessing the power of naturally occurring biochemical conversion processes. Microorganisms are used to break down biomass - Anaerobic Digestion is an example of this. Biogas is a type of biofuel that is produced by anaerobic digestion or fermentation of biodegradable materials, including biomass. Biodegradable waste can, for example, be converted to methane - which is a renewable energy source. So are Biofuels the answer? It remains to be seen whether or not biofuels are a long term solution to the problems surrounding the energy industry. There are certainly discussions to be had about the impact that the production of biofuels has on carbon emissions and biodiversity, but these are certainly not the only issues. Last October a young entrepreneur named Daniel Bida got together with a group of like-minded individuals and approached the management of the Toronto Zoo with an innovative idea. They knew the zoo was interested in building a biogas facility that could turn manure from elephants, giraffes and other animals into renewable electricity and heat. They also knew that after several years of trying the zoo, despite its good intentions, couldn’t make it happen. The project it envisioned was simply too complex and risky for commercial investors. Bida proposed a new approach: build a smaller, more manageable facility and open up investment to the broader community through the issuance of bonds. He was inspired after watching Toronto’s Centre for Social Innovation (CSI) purchase and retrofit a building using $2 million it had raised selling community bonds at $10,000 apiece. The bonds, which could be purchased by anyone, offered a 4 per cent annual rate of return over five years and were RRSP-eligible. If the banks wouldn’t lend the money to a not-for-profit organization like CSI, then individuals who support the organization’s mandate just might. Tapping into CSI’s “social asset” proved a good gamble, as the community was quick to scoop up the bonds. “This told me that the whole community bond thing was for real,” say Bida, convinced he could adapt the approach to support renewable-energy projects. The zoo executives liked the idea and several months later Bida helped form the ZooShare Biogas Co-operative, a not-for-profit community co-op that plans to build a 500-kilowatt biogas plant at the zoo for about $5 million. Electricity from the plant will be sold into the grid under the province’s feed-in-tariff program, while waste heat could end up being pumped into a nearby greenhouse, potentially used to grow bamboo for the new pandas expected to arrive in 2014. About 70 per cent of the project, or roughly $3.5 million, will be funded through the sale of community bonds that, like the CSI bonds, could be purchased through a self-directed RRSP. ZooShare hopes to offer bonds with a seven-year term and up to a 7 per cent annual return on investment. For existing zoo members and those living within one kilometre of the zoo, the bonds will be sold in $500 units. Everyone else can pick them up for $5,000 each, unless they want to purchase a zoo membership. “We’re hoping this will sell more memberships for the zoo as a result,” says Bida, whose company ReGenerate Biogas is managing the project. ZooShare is just one of several co-op ventures going the community bond route to raise capital for renewably-energy projects. Others include Options for Green Energy, SolarShare and WaterShare. Their approach represents a low-risk investment for people who want to support “green” community projects and make some money, but who don’t want to spend thousands of dollars putting solar PV systems on their own rooftops. It also offers a way for those without property, such as renters, or without the proper land or rooftop exposure, to participate in the feed-in-tariff program. Community bonds, in essence, make the FIT program more inclusive and get the broader population directly invested in their energy future, be it solar, wind, biogas or hydro. “This idea of massive public involvement in the ownership and economic benefit of these projects is what we’ve all been working towards for the past 15 years,” says Deb Doncaster, executive director of the Community Power Fund, which supports community co-op projects with grants and low-interest bridge financing. Social media will certainly play a role. Facebook, Twitter and other social networking applications make it much easier for community co-ops to reach out to supporters. Spreading the word to the right people has become almost effortless. Still, a couple of barriers need to be overcome before you or I can purchase such bonds. For one, RRSP-eligible community bonds must be approved and registered with the Financial Services Commission of Ontario before they can be sold. Some say the commission is dragging it feet. SolarShare, for example, wants to issue community bonds in $1,000 increments that would offer a 5-per-cent return annually and be redeemable after five years. The funds raised from the bond issue will support construction of solar PV projects across southern Ontario. It’s all new territory for the financial services commission, which has proved a major bottleneck. “They’re tight on the resources needed to deal with this new landscape,” says Matt Zipchen, who as project manager for the Toronto Renewable Energy Co-operative is overseeing development of SolarShare. It will all get sorted out over time. Indeed, all it will likely take is for one big bank to break from the pack before others start to follow. If demand for community bonds is high enough, that will likely happen. That’s what SolarShare, ZooShare and others are counting on. Running a generator (a.k.a. genset) on biogas is of interest to several types of facilities, from farms that hope to profit from manure to companies that need to reduce utility bills. However, as with any commercial generator installation, some key considerations should precede implementing a digester gas generator. In this article, we look the basic aspects of implementing a digester generator: project feasibility, implementation cost, and long-term results. For more detailed information, contacting a company that specializes in digester gas generator implementation is the best option. If a facility plans on producing biogas, the feasibility of a project instantly concerns two things: the availability of space for a biogas storage unit and anaerobic digester (a container that produces biogas from organic waste material), and the availability of organic waste material to fuel the production process. In terms of space, commercial anaerobic digesters can require as little as a few thousand square feet, but the largest units require significantly more. For some facilities, this instantly presents a problem. In terms of waste material availability, facilities that have free access to materials such as sewage, food waste, and manure are ideal candidates to implement anaerobic digesters. Anaerobic digesters are commonly linked with farming operations and water treatment facilities, but they are also used in other industries. Ultimately, the question becomes whether a facility can profit from the situation the way it envisions. If it can power its gas generator and supply gas to the rest of its facility-and perhaps even generate electricity-producing its own biogas could be more than feasible, especially at a time when gas prices are high and don't show signs of lowering. if a replacement generator is needed and a biogas storage unit can be accommodated, a generator service can implement a digester generator after the storage unit is ready to fuel it. Prior to purchasing the unit, a company should consult with a generator services provider to ensure the unit meets its emergency power needs. Implementing a high capacity commercial genset could easily require a high six-figure investment, especially when cost of labor and construction are added in. There are, however, some ways to deflate the cost of implementing a new genset, such as: buying from an independent dealer that will perform project management, buying a refurbished genset, and having an existing unit retrofitted with new technology instead of buying a replacement. Prior to making a buying decision, a company should discuss its needs with a generator services provider. For the right facility, a digester gas generator is an excellent long-term investment. It costs less to fuel than a diesel generator and a standard natural gas generator. And implementing an anaerobic digester could mean a facility pays nothing for fuel. Facilities that need a new genset should consider all options, a gas digester model included. But the decision should ultimately be based on what works best for a their emergency power needs. In my research on generator services, I've studied the potential value of implementing a digester gas generator. In the last decades, the development of Jatropha curcas plants has been an increasing trend significantly. Several countries in Asia, Africa and South America develop bio diesel from its seeds. Studies on conversion of this plant into bio diesel has been conducted by many researchers in the world. Jatropha Curcas waste, such as cake seed, sludge, and shell, has been potential to convert into solid fuels. Some researcher converts its material into biogas through an anaerobic digestion system in digester. As reported many authors, that the cake seeds of Jatropha curcas contain around 61-67% crude oil per unit weight. Meanwhile, the content of raw oil is around 33 to 39 %. This means that there is a high possibility to extract Jatropha Curcas waste into energy both from shell and cake seed. Combustion is a chemical process to convert solid waste into heat energy. The process includes drying, pyrolysis, and char combustion. In the pyrolysis process, carbon monoxide rises to the peak level and gradually decrease until char combustion reactions stopped. The products of biomass combustion consist of carbon dioxide, water, ash, sulfur oxide, carbon monoxide, unburned hydrocarbon particles, nitrogen oxide, smoke and soot. It is an opportunity to form Jatropha Curcas waste as briquettes and uses for fuel. This fuel can then be used in rural areas for cooking. If the production this fuel is high, it can be used for commercialization. It means that its briquettes send to the combustion reactor to heat a boiler system and produces electricity. The rising cost of electricity, along with the unmistakable impact of global warming on the planet, have prompted more research into so-called clean power, from renewable sources that include solar, wind, and biomass technologies. Producers of these types of technology also are quick to point out that if Americans yearn for less vulnerability to terrorism and political instability in other parts of the globe, greater energy self-sufficiency ought to be a national goal. Numerous states also provide tax credits or rebates for renewable energy projects, and there's a federal renewable power manufacturing tax credit (PTC) of $19 per megawatt. It is set to expire at the end of 2008, but Congress is considering extending it through 2013. In addition, the 2006 Energy Act offers businesses a tax reduction of up to $1.80 per square foot, either for new construction or renovation that saves at least 50 % over the comparable cost of heating, cooling, lighting, and/or water use of a comparable making without these technologies in place. The savings amount depends on which, and how many, resources you're conserving. At the turn of this century, solar power-generating capacity worldwide was just over 3 million megawatts, but it's estimated that by 2020, it will surpass 5 million megawatts. Production of solar photovoltaic (PV) cells and modules truly began to take off within the 1990s and, by 2003, it was almost a $5 billion industry. In the exact same time period, nevertheless, Americans' dominance within the market as manufacturers of these techniques fell from 40 percent to 14 percent, losing ground to Japanese- and European-made systems. The tiniest solar PV cells are used in calculators and watches, but when bigger cells are grouped together in modules of 40 or so, and multiple groups are mounted together (in configurations recognized as arrays), PV cells collect sunlight and convert it into sufficient amounts of electricity to power companies and residences. It takes 10 to 20 arrays to power a household, according to the American Solar Energy Society. It takes lots of cells to make power because only about 15 % from the sunlight that strikes the cell is utilized to generate electricity. The industry is working tough to increase efficiency. In larger installations, the arrays collect and focus sunlight with mirrors to create a higher-intensity heat source, in a procedure known as Concentrating Solar Energy (CSP). However, solar panels are created of silicon, and a silicon shortage in recent years has driven the price up substantially. Today, it can cost as much as 25 cents per kilowatt-hour to produce solar energy, more than double the price of any other fuel supply. Solar energy is as adaptable as electricity generated any other way: It may be utilized for heating water, heating or cooling air, and so on. It can be incorporated into making design-an advantage more than wind turbines, for instance-and a solar program is very low maintenance. In producing the decision to "go solar," try to determine the life cycle or life expectancy of the program prior to you buy as nicely as the potential tax benefits. Solar systems used to heat dishwashing water qualify for a federal energy-saving tax credit of 15 %, plus a 10 % business investment credit: a total tax write-off of 25 %. Nevertheless, as your accountant will surely explain, you must first spend the cash to be able to write off the expense or receive the rebate. Learn more about solar power technology at the Web site from the American Solar Energy Society, ases.org. Wind energy is an additional renewable power source, which any farmer with a windmill has known for years. A single, old-fashioned windmill produces from 1 to 5 kilowatts, just sufficient to pump water for livestock or house use, but new technology allows the progressive farmer to retrofit an existing pump program to produce 300 to 500 kilowatts-enough to power the property's irrigation program. They're not known as "windmills" anymore, but wind towers and windfarms. Wind currently offers about one % of the world's total power needs, but it is an industry having a bright future, growing 20 to 25 % per year. Germany and Spain are the nations with the most wind-generating capacity; the United States, Denmark, and India round out the top five, according to the Globe Wind Power Conference. Total installed wind energy capacity within the United States is about 12,000 megawatts, with a lot more than 2400 megawatts installed in 2006 and numerous a lot more projects within the planning stages. Texas and California seem to compete each year for top honors in the American Wind Energy Association ratings, with the states of Iowa, Minnesota, and Washington also kicking wind production into high gear in recent years. Some people complain that the giant towers and turbines are noisy and unattractive, particularly in large numbers, as nicely as hazardous to birds. Wind energy advocates are making technical breakthroughs to bring down expenses and make manufacturing more reliable, but natural gas-fired plants can produce electricity at 3 cents per kilowatt-hour or much less, while windfarms produce energy at about five cents per kilowatt-hour. Studies say this cost might be reduced enough to compete with gas-fired plants if windfarm developers could obtain the exact same favorable financing terms as utility companies, or if the utilities would be willing to own the windfarms. Increasingly, the latter is the case. Utility companies see the benefits of good public relations for "going green" and adding renewable power to their portfolios. This also helps mitigate an additional problem within the western United States: Some small windfarm owners are fighting with utility firms over whose responsibility it is to pay for and construct the additional power lines to connect their output to the grid. It may not be feasible for you to install a wind turbine outside your restaurant, but you can request that your utility provider's portfolio include wind resources. You are able to understand more about the expenses and feasibility of wind power at awea.org, the Web website from the American Wind Energy Association. The organization has European (ewea.org) and Canadian (canwea.org) counterparts. Biomass is the term for organic materials (from plants or animals) used to produce a fuel supply. It may produce electrical power or fuels to power vehicles. Biodiesel and ethanol (ethyl alcohol) are examples of biomass fuels. Biomass is also being utilized to create new-generation plastics which are recyclable, for items such as utensils and food containers. Restaurants' grease traps and trash cans are as good as gold to biomass power producers. The Biogas Energy Project at University of California, Davis, created its very first attempt at large-scale use of restaurant waste to produce electrical power starting in 2006, and it is been a success. Waste collected from San Francisco area restaurants is pumped into an anaerobic digester, a specialized vat usually used in wastewater treatment plants, which combines the sludge with bacteria to break it down. The procedure creates hydrogen and methane gas that can then be utilized as fuel or burned to produce electricity. Its creators say 1 ton of waste can energy 10 houses for a day, while keeping that ton of waste out from the landfill. About one million American homes and businesses utilize geothermal heat pumps, to both heat indoor spaces in winter and cool them in summer, requiring about 20 % less electricity than they would without having heat pumps. Federal legislation in 2005 increased the financial perks for this type of system. Franco Zinzi has been involved with online marketing for nearly 3 years and likes to write on various subjects. Come visit his latest website which discusses of Restaurant Fridges and fridges supplies for the owner of his own business. NAIROBI (AlertNet) – Alphonse Wesonga used to criticise the Kenyan government for failing to clear Lake Victoria of its choking swathes of water hyacinth. But since discovering he could make money from the invasive weed 10 years ago, the 60-year-old trader from Busia village has joined hundreds of lakeside dwellers who provide for their children by making ornamental furniture and baskets from the floating plant. Now, however, a new generation of environmentalists is promoting an innovative way to rid the country of one of Africa’s wildest habitat colonisers using green technology – a portable unit that can generate biogas and liquid fertiliser from water hyacinth. The anaerobic digester normally produces gas from animal waste. But in trials at the weed-infested Nairobi Dam and Naivasha and Victoria lakes, it succeeded in breaking down water hyacinth on a large scale, according to its inventor Dominic Wanjihia of Biogas Africa, a Nairobi-based social enterprise that develops renewable energy technologies for marginalised communities. By inoculating the digester’s contents with a bacteria obtained from animal intestines, it is able to process green, lush plant matter to produce biogas, as well as liquid fertiliser for use in urban agriculture. The digester has a large surface area exposed to the sun, enabling it absorb solar energy to catalyse the process of anaerobic digestion. It is spread as widely as possible across the ground to allow it to absorb the sun’s heat. But this also exposes it to scorching, which can cause it to wear out quickly. So for protection, it is fitted with a shade net that filters out 50 percent of the sun’s ultra-violet rays. But won’t the dome-shaped bio-digester with its heavy-duty rubber cover and PVC pipes put hyacinth traders like Wesonga out of a business that fetches him up to 200 Kenyan shillings ($2) per basket? Yet it may become easier if the goals set by the 2008 Kenya Energy Sector Environment Programme (KEEP) are met. The government is aiming to shore up its national power grid with new capacity - 85 percent of which will come from renewable energy - a trend the country’s environment secretary says is starting to pay off. “The policy document was meant to direct government programmes to solutions that engage the community in adapting to climate change and encourage innovations that position the country as a green economy,” says Alice Kaundia. Nickson Parnisa, one of the first Kenyans to benefit from the Biogas Africa bio-digester, uses animal waste to generate gas, which is funneled to his family’s ring stove through a plastic gas pipe. The 30-year-old father of one, a pastoralist from Kajiado in the Rift Valley region, south of Nairobi, says he no longer minds cooking. Biogas is starting to replace wood as a source of energy, making it easier and cleaner for men to perform kitchen chores, a trend previously unheard of in Maasai culture. “I have found it wise to move the kitchen into the house because this new outfit does not produce choking smoke,” says Parnisa, who received his mobile bio-digester in February free of charge. At a cost of 45,000 Kenyan shillings ($525) per unit, a domestic-scale facility can service an average of 45 people with a 10kg load of cow dung, while a larger version that feeds on 60kg of slurry can be used to run a commercial canteen, says Wanjihia. The Kenya Industrial Property Institute (KIPI) has patented the design of the mobile bio-digester, meaning it can now be promoted widely. The National Council for Science and Technology (NCST) has indicated it is keen to support creative initiatives like Wanjihia’s through its Young Innovators Club. It manages a two-year-old Science and Technology Innovation Fund of 320 million Kenyan shillings ($3.7 million) which has so far supported 10 projects in Kenya, including a car tracking system using a mobile phone and another gadget that produces a sound attracting fish to bait. Some of the money has been allocated to women researchers, and some has been earmarked for young product developers, according to NCST Secretary Shaukat Abdulrazak. A panel of experts is reviewing 99 projects that have applied for financial assistance. “Most of the projects we have funded are related to telecommunication, information and communications technology (ICT) and innovations that reduce reliance on traditional sources of energy, such as fossil fuel and biomass,” says Abdulrazak. Wanjihia of Biogas Africa, meanwhile, is looking to take his green energy device to the next stage. “What the social enterprise needs now is to move to the investment phase with an eye for mass production,” he says. David Njagi is an environmental writer based in Nairobi.